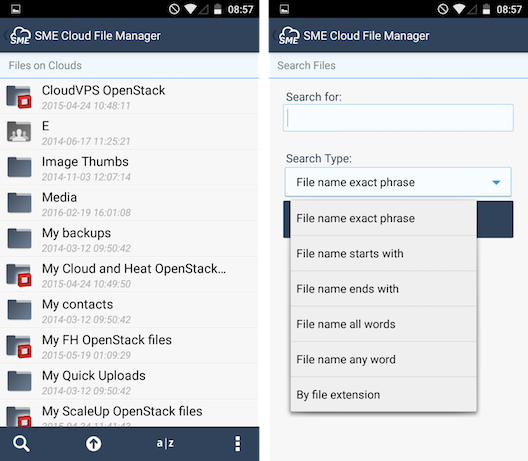 SME Cloud File Manager is the Android client for the Storage made Easy cloud platform. The App can be used as a standalone App and also with our free, Personal, Business and Enterprise solutions. For Enterprise customers the App can also be branded. The sign in screen is where you can sign into your SME Account. You need a valid account with StorageMadeEasy.com to do this. There are many free accounts so all you need to do is sign up. You can do this from the website Storage Made Easy website which may be a quicker experience. If you wish to do this from the website you can find out more about this process from the Getting Started Guide. From version 1.6 you can now register in App' or you can just choose to register from the website and then enter your login details in the App. If you wish to do this from the website you can find out more about this process from the Getting Started Guide. Once you have entered the registration details in-app you are taken to a screen where you can select the package you are interested in using. 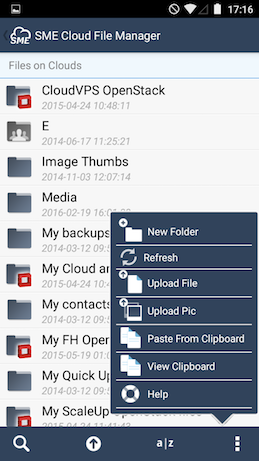 The default is the free package which includes 5GB free storage from us and the ability to add 3 other clouds. Once you have completed selecting your cloud you will receive an activation email to activate your account. If you do not receive this please check your spam and if you still do not receive it, it may be you misspelt your email or in rare cases the email may have been blocked by your ISP. In this event please drop us an email and request we activate your account. Once you have registered you will receive an activation email. If you registered with the email address that you have access to from your phone then this can be accessed direct from your phone. Once it arrives you can just click on the link to authorise the email address and the account. This will launch the web browser and you will receive a message to let you know activation is complete. 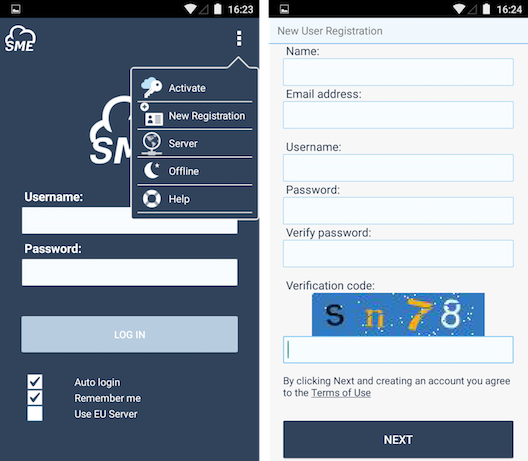 Alternatively you can cut the unique code and paste it into the activation code direct from the App (accessed from the activation menu option on the login screen)..
You do not need to activate if you already registered for SME - just login. 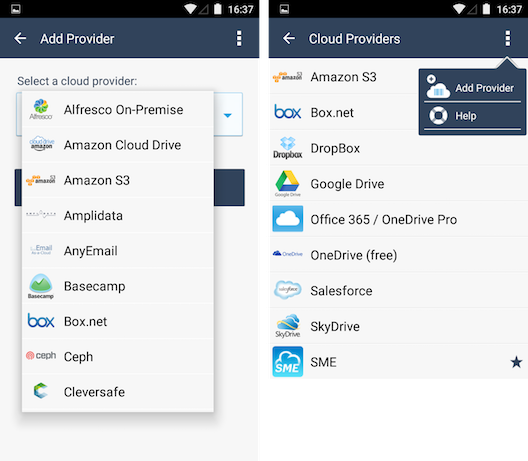 You can Add your first Cloud by choosing Cloud Providers from the Menu and choosing “Add Provider” from options. You will then be taken to a wizard where you can choose the Cloud you wish to add. 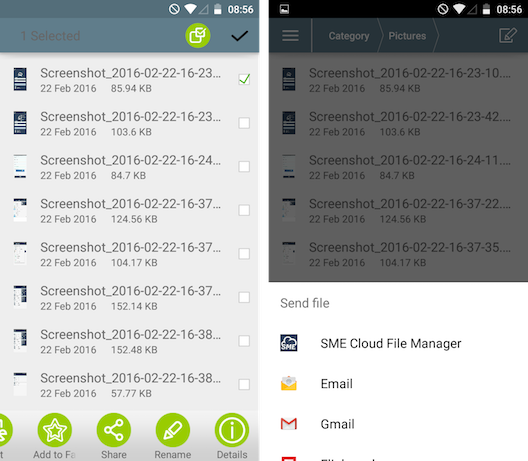 At the end of the wizard, what we call a “Cloud Sync” task will be started to refresh the view of your files through the Android client. You can wait for this to complete or exit the App and login later. The process occurs on the server side so the App does not need to be running. When you log back in you can check the status of this from the 'Cloud Tasks' menu option. The first screen you see after logging in is the Menu. From this screen you can choose which functions you would like to invoke. This is the main menu screen you navigate back to/from your menu choices. Find the App too complicated ? The simplified menu option removes the advanced options and keeps the basics available. You can easily change between views just by choosing this option from the menu. https is used by defaultt to encrypt connections from the App. This can slightly slow down performance and upload / download speeds but provides encrypted data traffic using https. Note however that some versions of Android have a known bug that prevents SSL from being used and could result in an error on certain Android operating systems. The PIN Lock can be turned on from the settings. It enables you to secure the App and will prompt you for a PIN on startup or if the App is backgrounded and then brought back to the Main view. In this model resetting the secure key can effectively revoke account access. Other Cloud Providers use only the username and password authentication model. In this model any authentication details you provide are stored encrypted using an external seed to generate the encryption key. To revoke access in this model you simply need to change your account password. 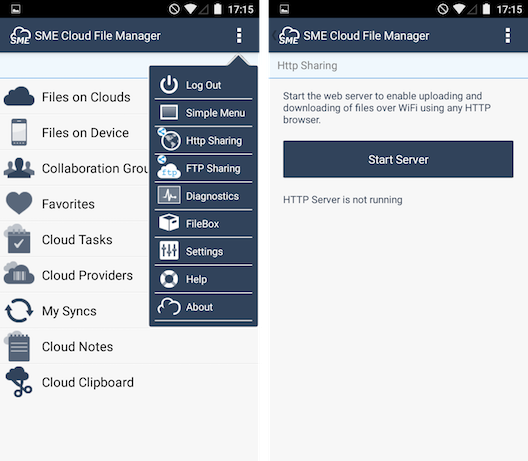 One of the benefits of uploading files to your Cloud from the SME Web File Manager and Desktop tools is that they are stored encrypted on the underlying Cloud (such as Google Docs, DropBox, S3 etc). When you do this only you know the key that is used, it is not stored with SME. If you lose the key then you will not be able to access the file. 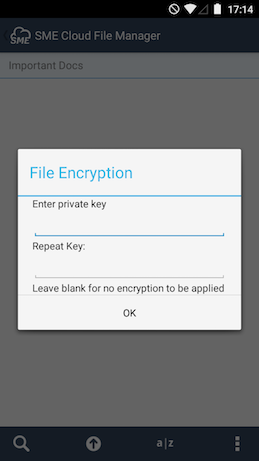 The key is used as the seed to generate the AES 256 bit encryption for the file. When you try and access this file from the Android client (and any of our other desktop or mobile tools you will be asked for the password you originally assigned before you can access the file. Once you provide this, the file is downloaded locally (unencrypted). Desktop Tools also exist to un-encrypt files locally. 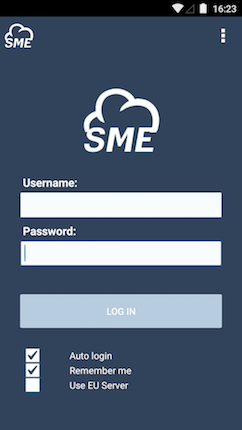 You can find out more on the SME Cloud Tools page. Once you click on the HTTP Sharing button from the Main Menu options you will be taken to a screen where you can start the http / web server. Clicking Start Server will give you an address that you can visit to upload files. The HTTP Sharing service, when running, will appear in the Android notifications taskbar. When it is stopped this is removed. ** Note that on clicking Start Server for the first time, you may need to click it again as the first click completes an initialisation. Once you have click to access the FTP sharing from the Main Menu, Menu Options you will first need to assign a username and password. Once this is done you can choose to start the FTP Server and you will be given a FTP address to access from your FTP client. The FTP Sharing service, when running, will appear in the Android notifications taskbar. When it is stopped this is removed. When you added Cloud Storage Providers to your Account the storage provider is added as a directory within something we refer to as a virtual cloud file system. This cloud file system lets you see your files from several different clouds as if they all existed in one directory - pretty neat I think you will agree. Oh, and your files don't move anywhere ! They are still on your original cloud storage. We don't cache the files or copy them to our servers. We just cache the information about your files to enable us to create the virtual cloud file system view. To navigate within directories, if you have a trackpad or a wheel on your phone, you can select the directory and click, otherwise you should double tap on the screen. 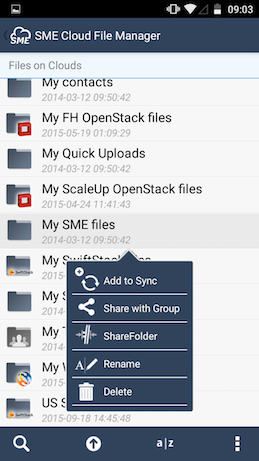 Share: Enables secure sharing of a file. Cloud View: Opens a file directly in a viewer in a web browser. Make Favorite: Makes the file a favorite so that you can view it from the Favorites menu option. 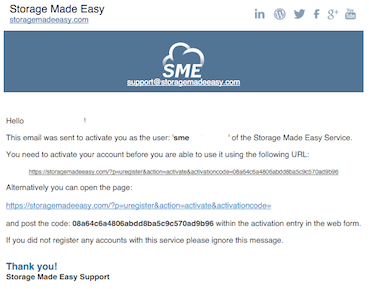 Make Public: This makes the file public in SME which means it appears on your Public Files page, whose URL is StorageMadeEasy.com/<username>. 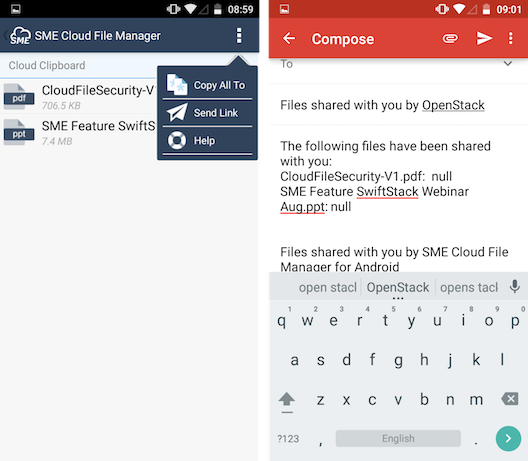 Send to Cloud Clipboard: If you want to share many files from different clouds you can choose to add them to the SME Clipboard and when finished go to the 'Cloud Clipboard' menu options and choose to share the files that reside there which will result in an email being created with file links for all of the the files you shared. Send link to Twitter: This option is only useful if you have entered your Twitter details in SME. If you have, you can create a message and share your file directly on Twitter. 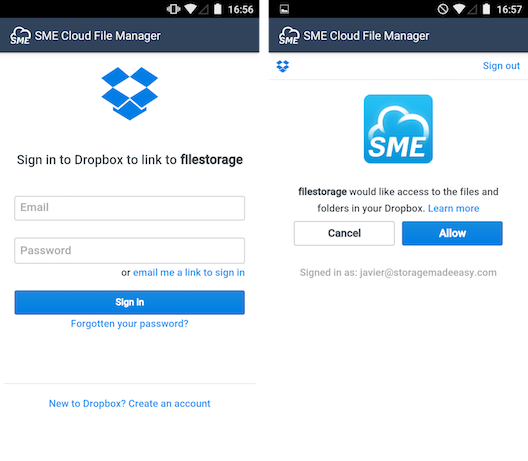 Delete: This deletes a file from your SME Cloud Files view and moves it to Trash. It does not remove it from the underlying cloud unless you visit the website at StorageMadeEasy.com and choose to remove Trash. You can also set this up as Cloud Tasks options that you can start from the phone. Add this dir to sync: This adds the current directory to Sync. You can select as many different directories as you wish to be added to sync. You can sync these directories down to the phone from the “My Syncs” menu option. 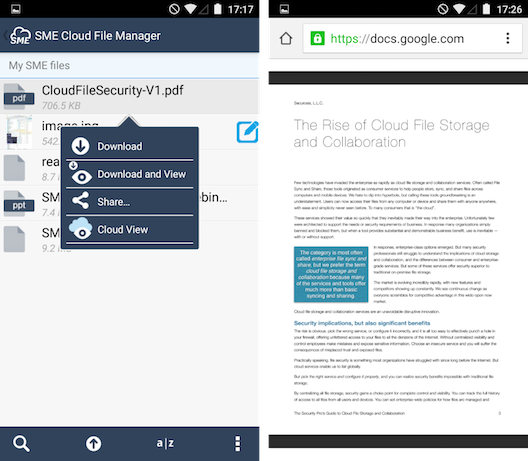 Cloud view enables the viewing of documents and other file types direct in Google Viewer.in a web browser without having to download a file. It works with files stored in any Cloud mapped to your account. Also if you are logged into Google Docs you can actually bring the file directly into Google Docs to edit. 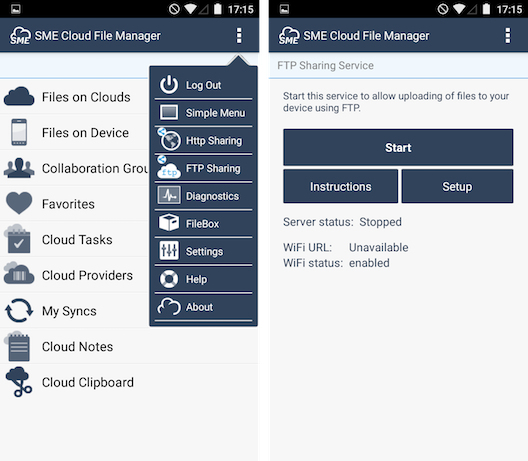 Business users of our Cloud File Server package will see that team Shared folders created by Cloud File Server Administrators are accessible from the Android client App. All ACL permissions on files are also applied. 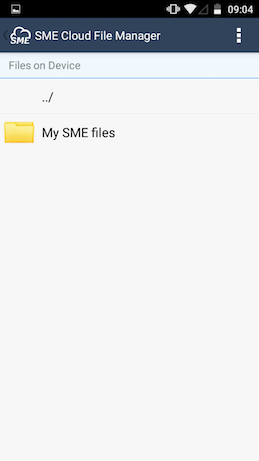 You can upload a file to your cloud from the Cloud Files directory by clicking the Android Menu function and choosing the Upload file option. 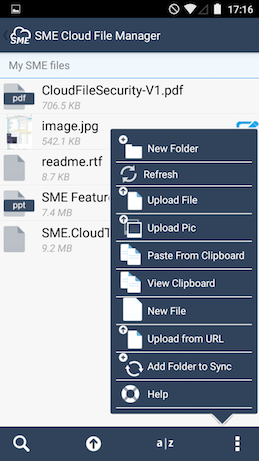 If you upload a file into one of the cloud mapped folders, it will always be uploaded onto the cloud that is mapped to that folder. So, if you upload a file “My File.doc” into the cloud folder structure “My OneDrive files→My Docs” then it will be placed into the “My Docs” folder on OneDrive. Simple ! Uploads are added to the Android taskbar. You can upload multiple files. If you click on the upload entry in the taskbar you are then taken to an upload screen where you can choose to cancel it or remove failed downloads. You can search for your files easily by clicking the search option on the Main Menu. If you have more than one cloud mapped to SME then the search will be done on the criteria you select against all clouds. For example if you have OneDrive, Amazon S3, and Google Drive mapped to your Cloud and you search for '.doc files' then the search will be done against all Cloud Providers and the results returned. Any file that is marked as a favorite in the File Menu is available for easy viewing From the Favorites menu. This is a handy way to get quick access to frequently used files. 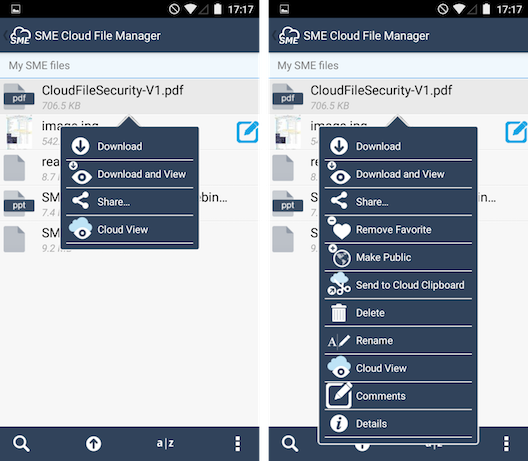 When navigating files in the Cloud File Manager you can choose to add files from any cloud to the cloud clipboard. When your done, and return to the cloud clipboard to send links to all files from the same email, even if they are stored on different Clouds ! From here you can check the status if they are scheduled, or you can choose to rerun tasks that have occurred previously but are completed. 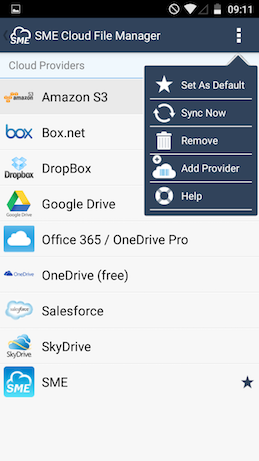 For example if you have previously sync'd your Amazon S3 File information with SME but want to redo the sync as you have entered files using another Amazon client you could do it from here. The same goes for any task. Note that you can rename the sync title that you see from the 'Cloud Sync Tasks' menu option which can access from the sidebar when logged into the Storage Made Easy website. 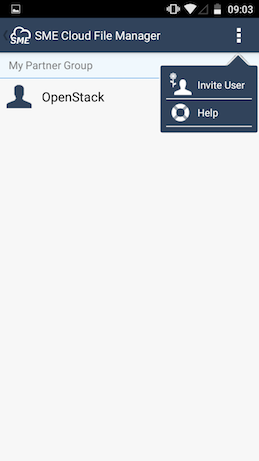 ou can create new business collaboration groups directly from the Phone. Collaboration groups are groups you setup to share file content with all members. You only need to share a file with the Group and all members get an email letting them know the filename that you shared with the group and that it is available for them to view. You can press and hold on a business group to perform further actions. 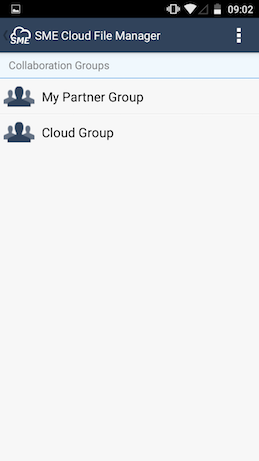 You can choose to rename or delete the group, or view its members. You can find out more about business groups and collaboration here. 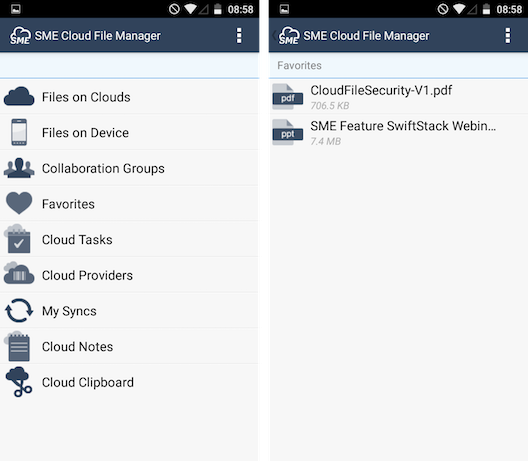 Note, You can control whether members can be collaborators from the Groups Menu with the SME Cloud File Manager. From the Business Group members screen you can view existing business group members and add new members. 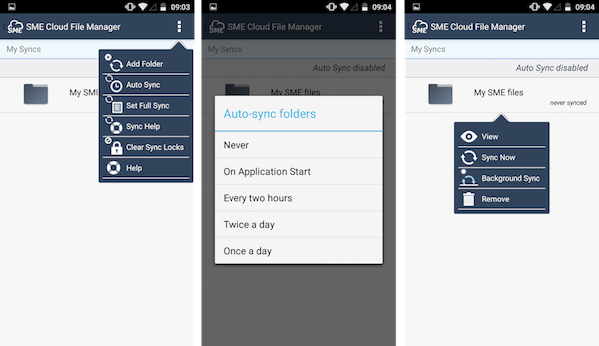 The SME Android Sync enables you to sync from a local directory to your cloud or from a cloud directory to your phone. 4. Repeat for each directory you added, whether it is added from the phone or the cloud. Each Time you wish to refresh your Cloud Files view, all you need to do is to go to 'My Syncs', select any directory you wish to refresh and choose to sync from the menu. Any updated or new files will be sync'd up to your Cloud of choice or down to the phone. You can also see the date and time of the last sync on the folder from within the 'My Syncs' view. If you wish to have all your sync folders update on login, you can choose the 'Sync All on Startup” from the “My Syncs” menu. This will initiate a background sync when you login. If you look in the top right hand of your screen after activating this option and logging in you will see a refresh icon to show you the sync is in progress. You can also go back to the My Syncs view at any time a background sync is running and check the last sync time on folders to check on progress. 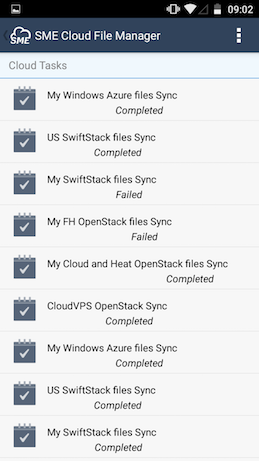 From version 2.1 of the product you can set up a scheduled sync between you cloud files/folders and your Android device. Once the sync is enabled you will see a notification in the Android taskbar letting you know when the next sync will occur. You can also choose just to highlight the folder you wish to sync and choose to sync manually. **Note - Auto Sync could provide to be expensive if you have a paid data plan so be sure to control it when you are using your cellular network. 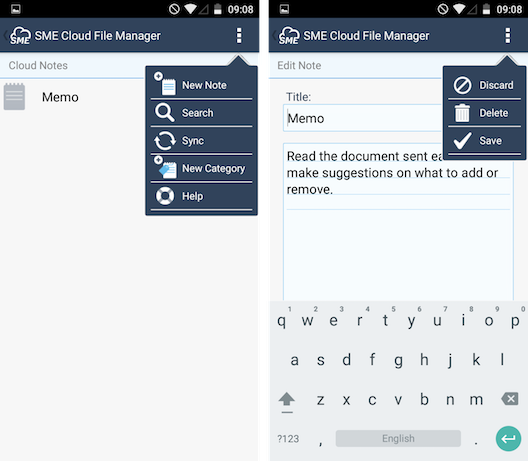 You can create notes directly in the SME Android App and choose which cloud they are stored on by setting the Primary Cloud Provider from the Cloud Providers Menu. By default notes are stored in a smart folder called “My memos”. There is no formatting, these are simply text files. The advantage of creating them in SME is that can be sync'd back to your underlying cloud, such as OneDrive or Google Drive for example. 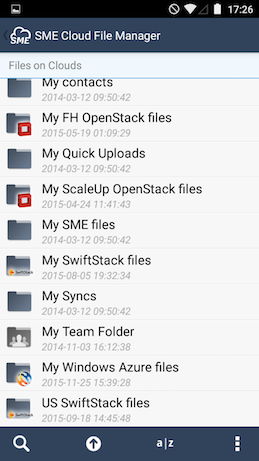 You can also assign categories to notes which become folders on your actual storage cloud. To sync notes up/down you just need to click the sync button available from the menu options. Send: Enables you to share the note using Android sharing options. If you choose the email the note will be attached. The App also enables a Notes widget to be added to a phone or Tablet for easy access to Notes. 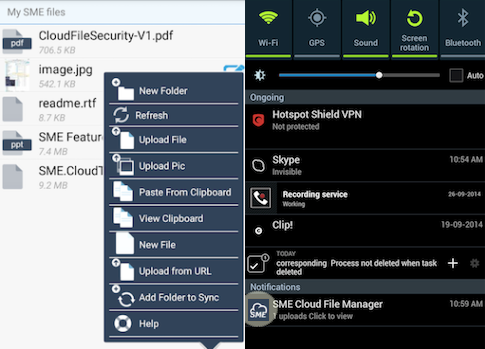 - Set a default provider (if you upload files to smart folders. This is the cloud where this files will be stored). 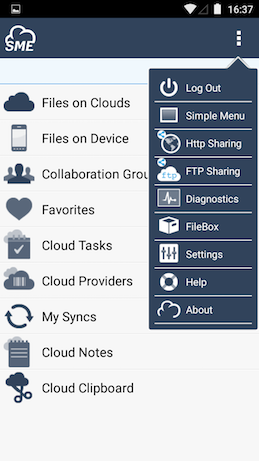 - Sync / Refresh the Cloud View - if you add files direct then you can update the cached view i the App by selecting a Cloud and choosing to sync.